Gluten-Free Chicken Soup. Healing and Good for the Soul. One of the best things that’s happened to me since I went gluten-free is how much better I feel. I have much more balanced energy throughout the day. I no longer experience “crashes” after lunch or a big meal and the immediate feeling that I need to take a nap (which I used to feel like everyday). In fact, when I do experience these symptoms I know it’s a sign of being run down and that I’m getting sick. Last week there was a nasty cold bug going around my work and it got the best of me. I felt really sick and needed some warm soup in my belly. I called my husband and asked him if he could stop at Whole Foods and get me some gluten-free soup. I was very disappointed when he called me from the store to tell me that NONE of the soups at Whole Foods that day were gluten free. Just my luck! I heated the chicken broth and put in the onion, carrots, and sweet potato. I knew the sweet potato was going to take the longest to cook so I let the broth cook until the sweet potatoes were soft. Then I broke up the rotisserie piece into big chunks and put them in the soup. I added handfuls of spinach because I had it in the fridge. Then I thought it was a good way for me to eat spinach so I added more and more. You can add as much as you want to your desire. I used Organic Spinach in a bag from Trader Joe’s. I love spicy foods so I added some cayenne pepper and a pinch of oregano to give the soup a kick. Wow, the cayenne pepper made it so tasty! The cayenne pepper and sweet potatoes were key ingredients in this for me. It tasted SO good and warm and healthy. I immediately felt better from eating it and I can’t wait to make it again soon. Now I will share my lovely impromptu recipe with all of you! If you try it, let me know how you end up liking it! Share in the comments! 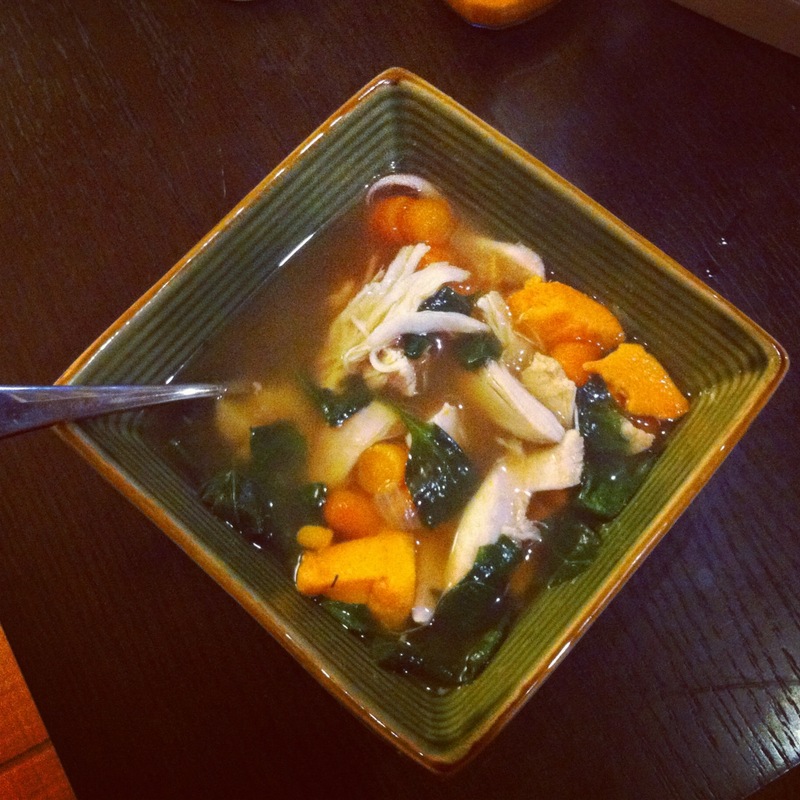 PS- For all you paleo dieters out there, this soup is 100% paleo friendly! Yum! I’ve been eating soup like crazy lately. It is SO good. I’m obsessed with it! Yummy that looks so good! Will try cooking it! Thanks for sharing!